I always think that you don't need to spend too much money on high-end makeup. Drugstore brands can be just as good. But what I do think is worth the investment are foundations. I don't know what it is but I am yet to come across a foundation that I completely loved in the lower price segment. Maybe you have some recommendations for me? 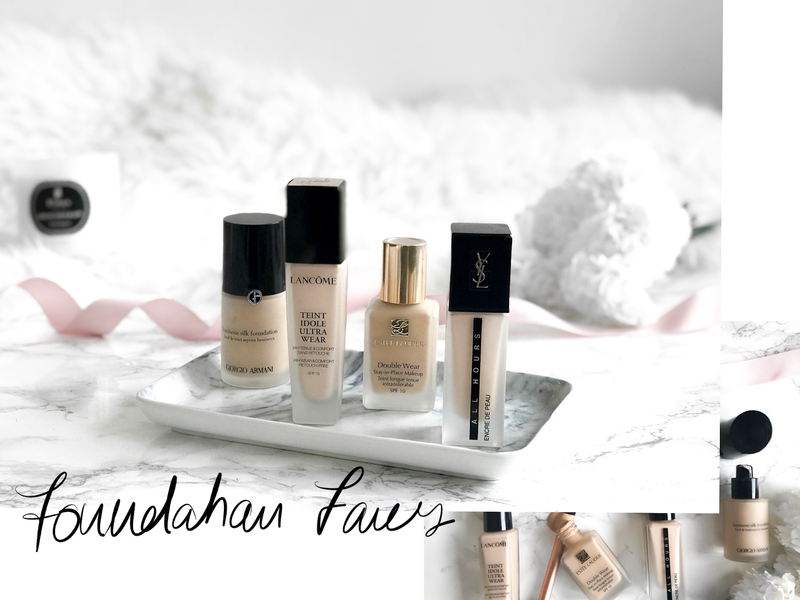 In the meantime, I will share with you my current favourite high-end foundations. This is the foundation I have been wearing the most in the last couple of months. And I have the feeling this won't leave my collection anytime soon. To me, it has the most perfect coverage (medium), is buildable and the most important: it doesn't look unnatural. I have quite dry skin so foundations tend to emphasize those dry areas on my face. But this for some reason doesn't do it at all. Such a comfortable everyday foundation. A total classic in everyone's makeup collection: Estee Lauder Double Wear. I will admit this is not the most natural looking or comfortable foundation that I own. It makes my skin feel quite tight. But I love to get this out for photos or for special occasions where I want the most flawless looking skin. And it lasts ages on your skin. I am obsessed with it! I find this one to be a good in between of the two foundations above. It has more coverage than the Lancome one but is way more comfortable than the Estee Lauder one. I love getting this out when my skin is acting up and I need the extra coverage, but I don't want to feel like my skin is drying out. This is my summer foundation. I do love it all year but for some reason, my skin agrees with it the most in the summer months. I tend to get quite sweaty on my face but this foundation still lasts and doesn't look weird at the end of the day. It is very glowy, very luminous and looks natural while lasting quite some time. I would say the coverage is low to medium but you can totally build it up. A must-have in everyone's collection! What is your current go-to foundation? I LOVE the Lancôme, and I love the YSL one, they are my go tos, but I love the Estee Lauder one too!! I have not tried any of these but I've heard amazing things about the Giorgio Armani foundation, specially saying that it is great for wedding makeup! I would love to try it. My fav at the moment is the new NARS foundation! I've been dying to try the Giorgio Armani one after hearing so many raves about it! Such amazing recs! I haven't tried any of these out yet and def want to cause your skin is always looking amazing! Oh you are so sweet Jen! Thank you! I also want to try Armani and Lancome ones you recommend as well! These looks sooo pretty! I'd love to try these foundations. Love your flatlays too dear. Great jobs! Girl you need it in your life! Love these photos babe! I love the Estee Lauder Double Wear! Want to try the Armani one too! I was sent the Estee Lauder Double Wear foundation for free so I definitely need to try it out. I absolutely lovee the Giorgio Armani luminous foundation as well. I´ve never try out any of these, but I heard great things about the YSL one! YSL is one of the best! I love the Estee Lauder Double Wear foundation. I've also recently discovered their Double Wear concealer. For my every day make-up, however, I tend to use a NARS tinted moisturizer. Works so great, especially with the concealer. I'd also love to try the Armani foundation you mentioned. Girl the double wear concealer is LIFE! Based on your photos alone I want to try all of these foundations!! I've always wanted to try the Lancome foundation. PS - You also have beautiful skin!! Great option ! Love your flatlays ! That Lancôme foundation sounds like a dream! I also have dry skin, and it's pale, so finding that perfect foundation is always on my mind. I'm definitely going to have to try that one out. YAY let me know if you liked it! I have the Lancome one and I love it! I really want to try the YSL one or maybe even a Chanel one! Oh yes I also want to try Chanel! It's so annoying when you can't find your shade! These are all my favourite foundations, I love reaching for them! Glad you love them as well Danielle! I need to try the YSL!! YSL foundations are always amazing! All these foundations are amazing! I haven't tried any of these foundations but they do sound wonderful. I've heard such good things about that Armani foundations so I definitely need to check it out. It's definetly worth trying hun..
Ah thanks so much.. will give it a try! Ooh these all sound lovely! I haven't tried any of them before but I'm only just starting to expand into the high-end foundations (still trying samples even hahah). I don't absolutely love any of the ones I've tried from the drugstore but there are some that I really like. I may have to try one of these!